Have you recently been diagnosed with oedema? If so, then you might find that wearing graduated compression socks or stockings helps with oedema treatment by reducing the swelling and tenderness. Many people have found that TXG Compression Socks have helped them deal with the impact of oedema as well as with other painful health conditions and injuries. Oedema is a medical condition that occurs when fluid builds up in tissue in a part of the body, most commonly in the legs, ankles and arms (peripheral oedema). It’s much more severe than the mild swelling most people experience after many hours of being on their feet. Oedema is often accompanied by pain, stiffness and weight gain which collectively can hamper movement, leading to even more stiffness and weight gain due to inactivity. Oedema can occur as a side effect of other conditions such as pregnancy and kidney/heart or liver disease. Oedema can also occur when taking certain medications such as contraceptive pills, corticosteroids or hypertension medication. It’s also been known to occur after injury or surgery to the legs/arms. Your doctor might recommend light exercise, massage as well as elevating your limbs to decrease the swelling. However, if a blockage in your lymphatic system occurs, lymphoedema can also occur which is a more serious, long-term condition than peripheral oedema. In both bases, our graduated compression socks will be helpful in decreasing your swelling and any resulting discomfort. HOW DO GRADUATED COMPRESSION SOCKS HELP TREAT OEDEMA? Research shows that oedema can be prevented and swelling decreased by wearing a compression sock with a pressure as low as 8mmHg. This results in a measurable reduction in the volume and circumference of the limb impacted by the condition. You will feel instant relief, allowing you to stay mobile and reducing your need for pain medications and their unpleasant side effects. 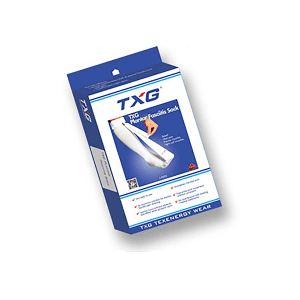 Why not try out TXG Compression Products for yourself? Simply touch base with us for more advice on finding the perfect graduated compression socks or stockings for you if you suffer from Oedema.